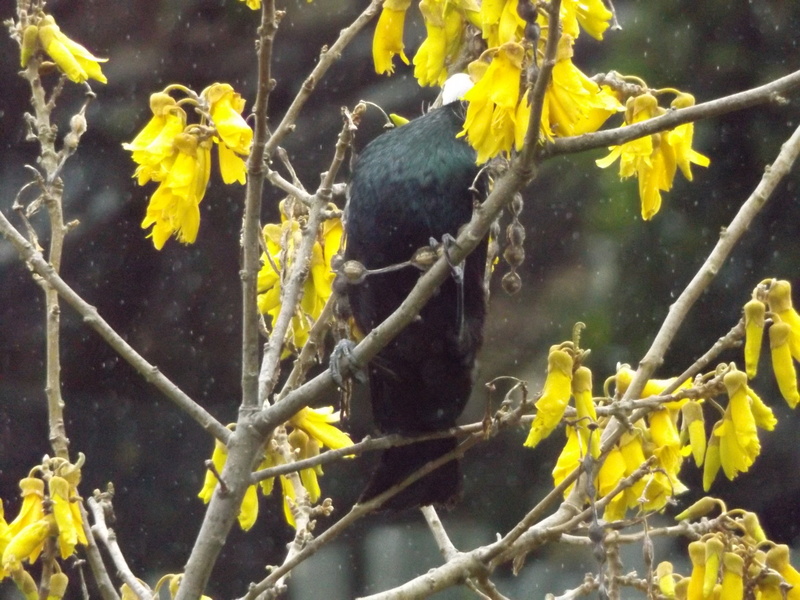 This entry was posted in Uncategorized and tagged kowhai flowers, Kowhai trees, nectar feeders, NZ birds, photography, rain, spring, Tui, weather on September 23, 2015 by ordinarygood. 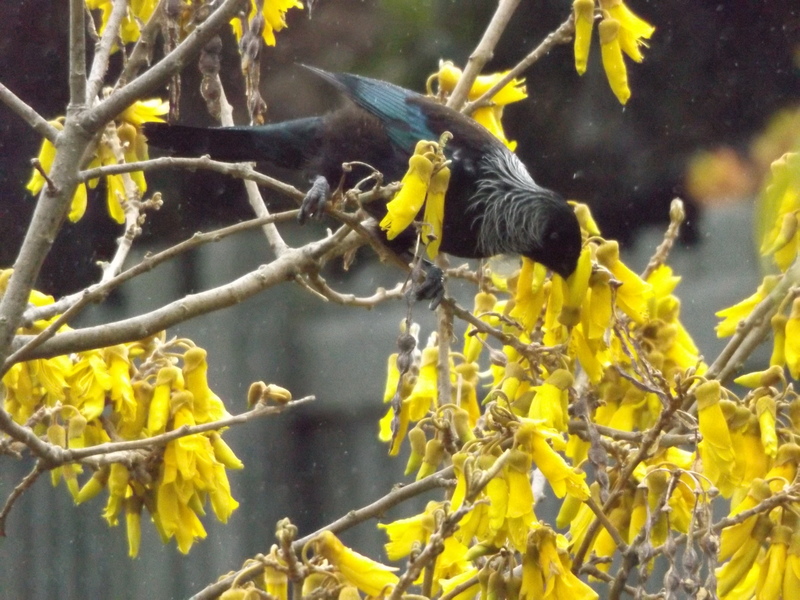 Earlier in the week with the weather looking more summery I noticed that the Tuis were not visiting the feeders nearly as often. 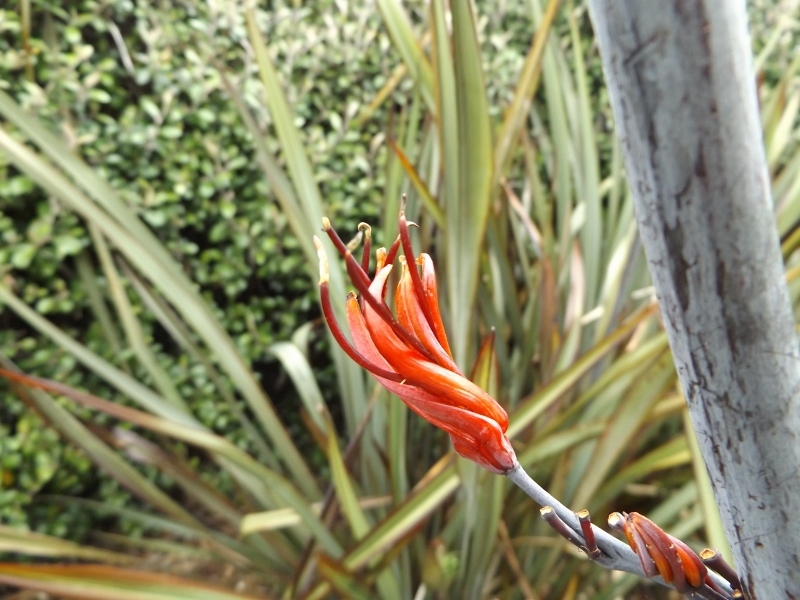 The flaxes are flowering and many other natural food sources are offering them good nourishment. However the tail end of a tropical storm reached us last evening with humidity and now rain. 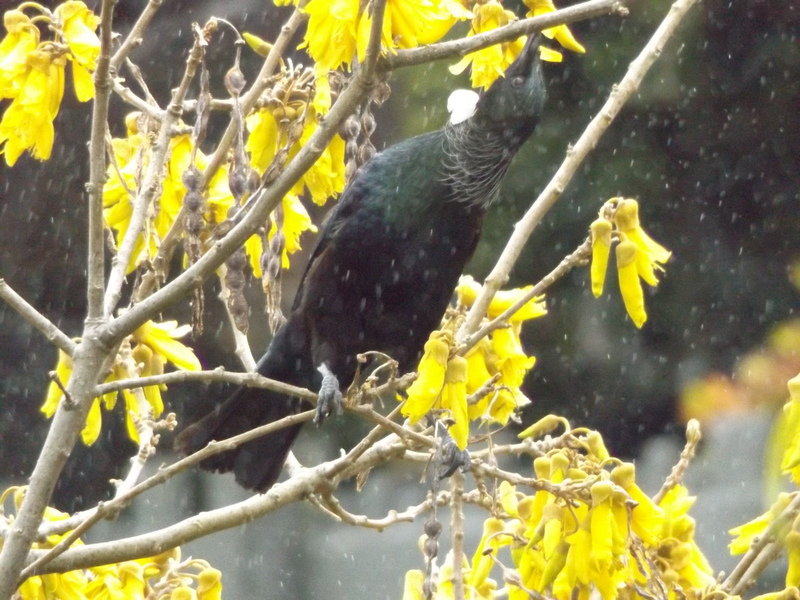 Quite heavy rain at times and the Tuis are back and in numbers. It is not as easy to look glamorous and well groomed today. 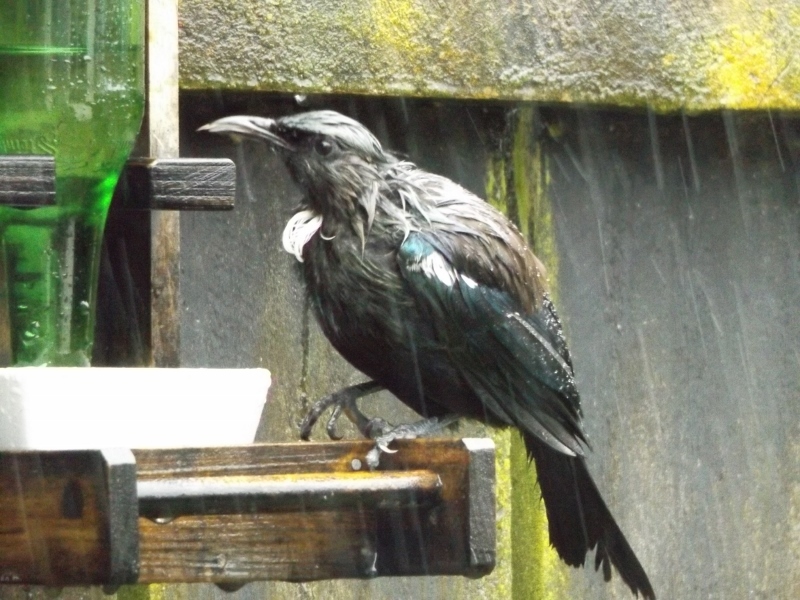 This entry was posted in Uncategorized and tagged bird food, birds, flax, flax flowers, natural food sources, nature, NZ birds, photography, rain, tropical storm, Tuis, weather, wet weather on December 18, 2014 by ordinarygood. Cabin fever was building yesterday so we rugged up and headed out for a brief walk. It was brutally cold in the wind but bracing and refreshing as our faces tingled and our ears chilled. 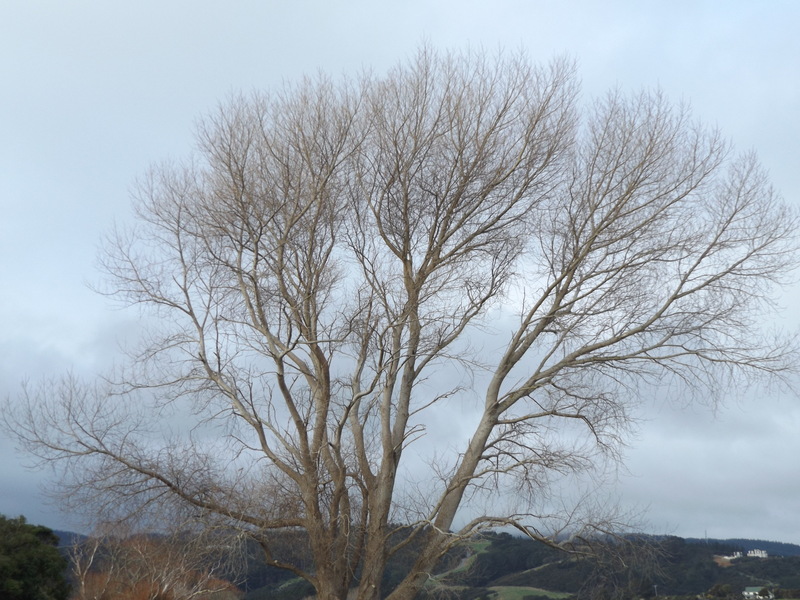 The stark, coldness of the day was mirrored in the bare branches of this very tall tree in the car parking area. But along the roadway and around a corner, in a more sheltered spot here was this tree glowing orange with such warmth. 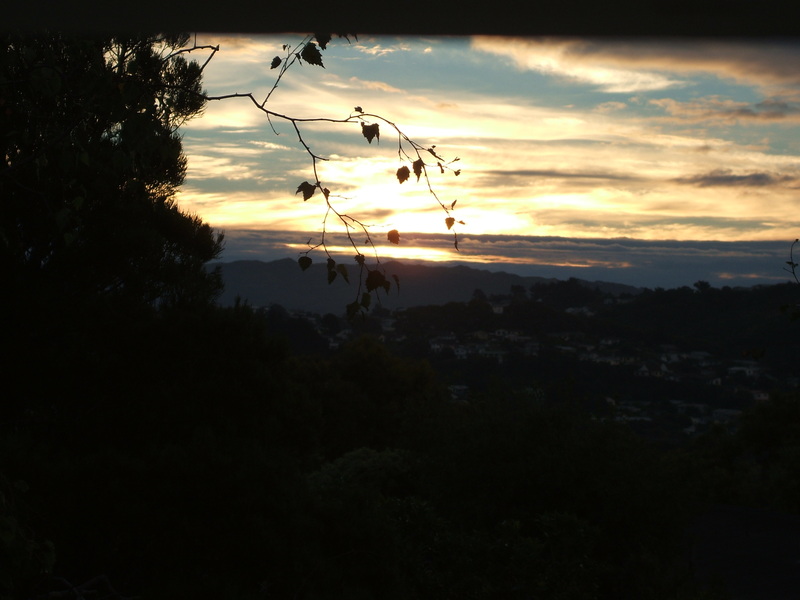 Then an early appointment this morning saw me visit Plimmerton where I spotted the sun shining brightly on Mana Island. However a slight turn southwards showed the real weather on the mainland. The winter season can present a range of guises to wonder at and enjoy. 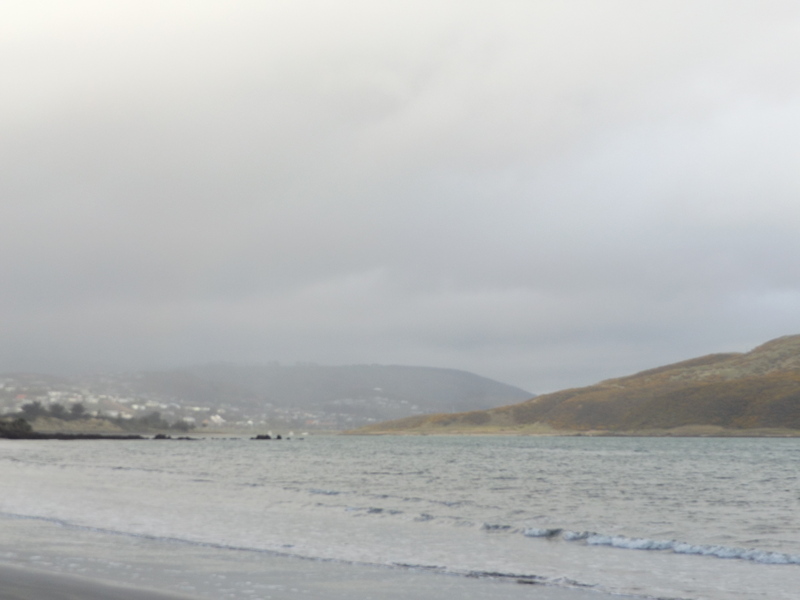 This entry was posted in Uncategorized and tagged clouds, islands, Mana Island, Motukaraka Point, photography, Plimmerton, rain, trees, winter trees on July 19, 2014 by ordinarygood. Maori (New Zealand’s indigenous peoples) have a concept Turangawaewae. Tūrangawaewae is one of the most well-known and powerful Māori concepts. 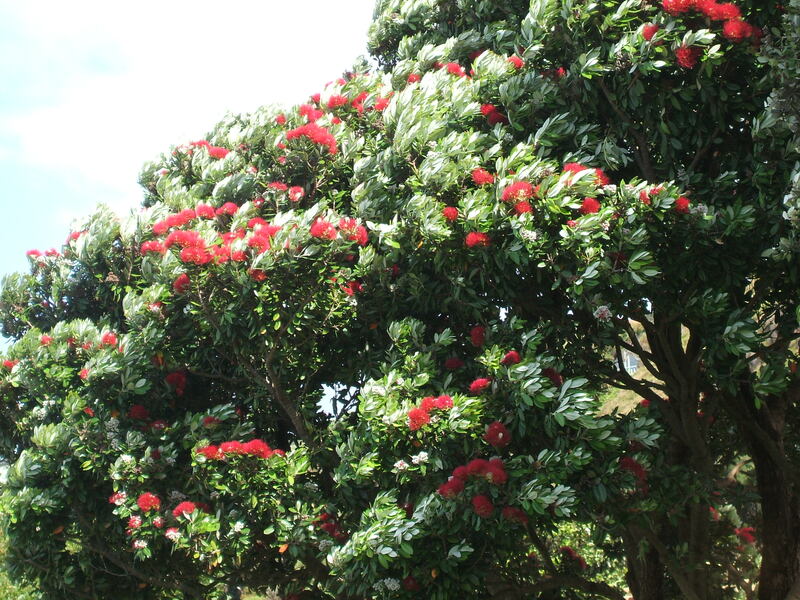 Literally tūranga (standing place), waewae (feet), it is often translated as ‘a place to stand’. Tūrangawaewae are places where we feel especially empowered and connected. They are our foundation, our place in the world, our home. Since the death of both my parents and now more recently the death of my brother, the place of my first months of life has increasingly become my Turangawaewae. 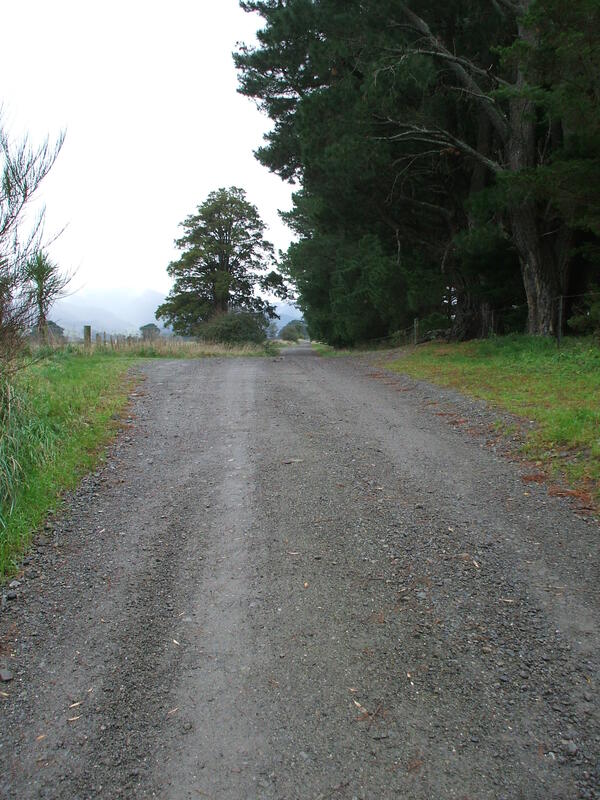 On a recent visit to Greytown, Wairarapa I went down River Road that leads from the house I lived in to the banks of the Waiohine River. 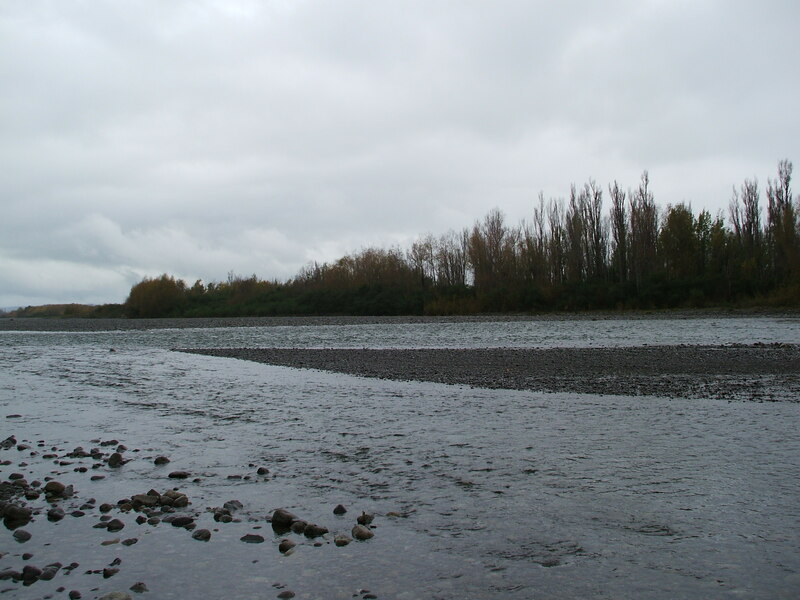 The river was grey-blue and running reasonably fast due to rain falling in the nearby mountains. 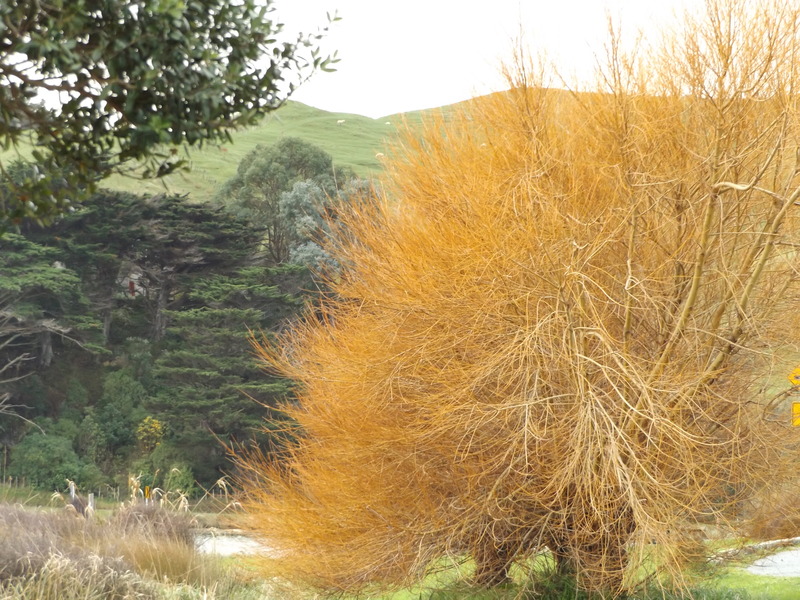 The trees on the banks were in autumn colours but the white light and heavy cloud dimmed those on this visit. My mountain was somewhere amidst these mists. The rain was falling steadily but it was a time to pause and reflect, to absorb the feelings of connection, and foundation. A place to draw strength from this land beneath my feet and then continue along my life’s road. 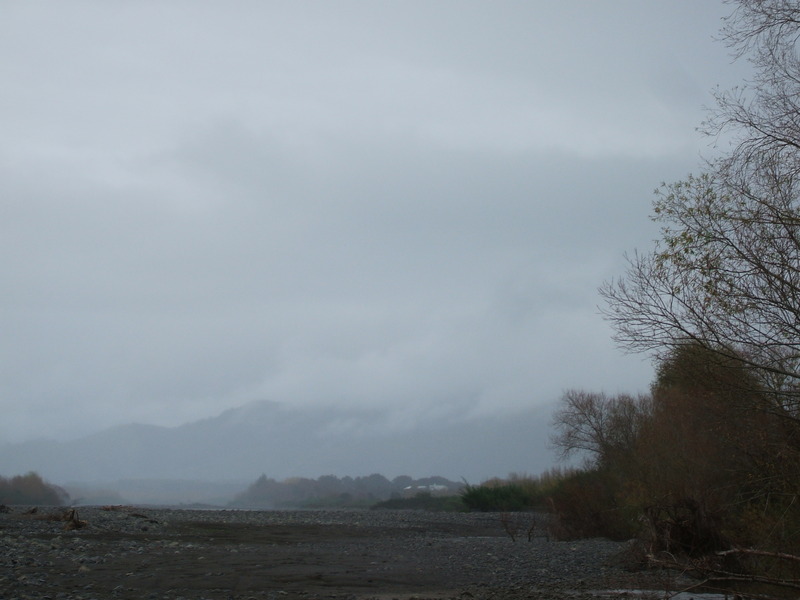 This entry was posted in Uncategorized and tagged Autumn, clouds, contemplation, Greytown, grief, loss, rain, reflection, Tararua mountains, turangawaewae, Waiohine River on May 26, 2014 by ordinarygood. 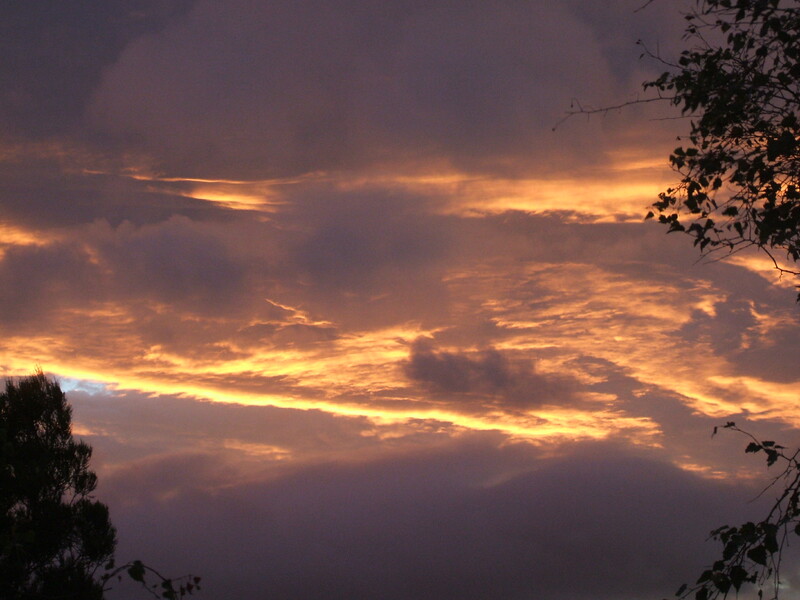 Red sky at night, shepherd’s delight…. 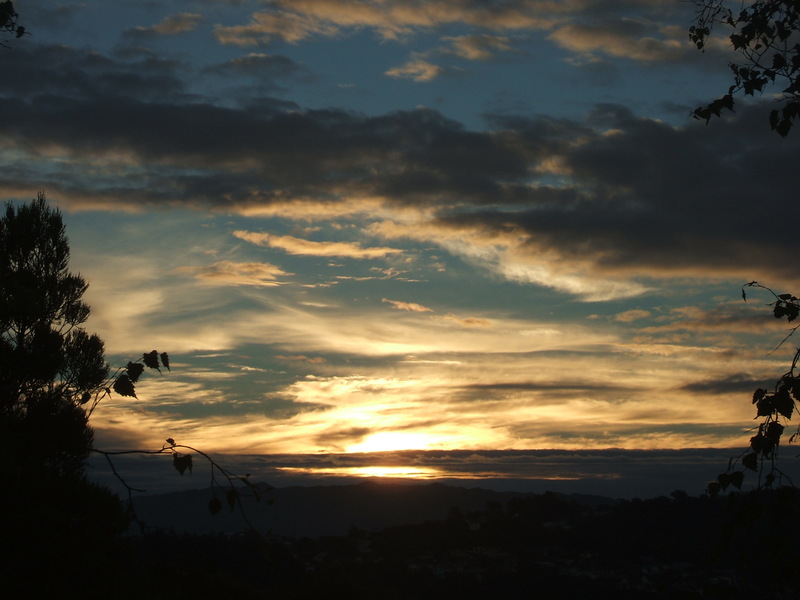 So many evenings of late have seen bright sunsets amid the clouds. This one from a few nights ago had us hopeful of a fine day following. This sunset from last night also held promise. 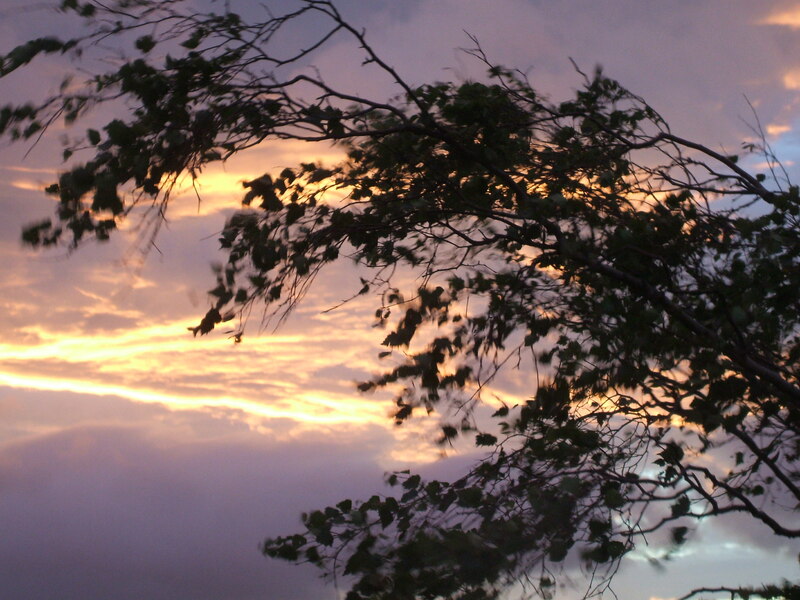 Although there was this gale bending the Birch tree over very dramatically. The gale lashed the house relentlessly all night and today has been little better. We were also drenched in rain with roads closed due to flooding. 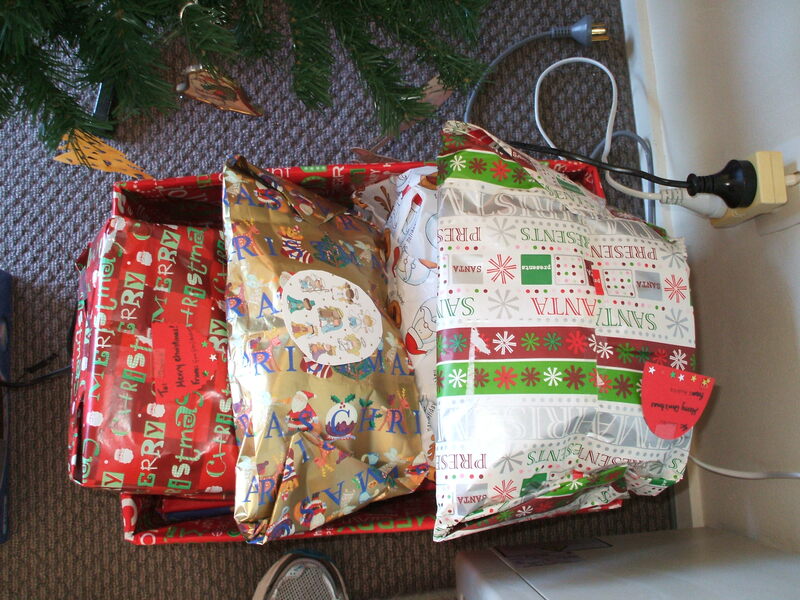 with plastic bags, loaded up food in a plastic clothes basket, donned our coats and off we went for lunch and a fun afternoon. A four year old and his two year old sister kept things lively and fun. The weather had cleared by late this afternoon although the gales continue. 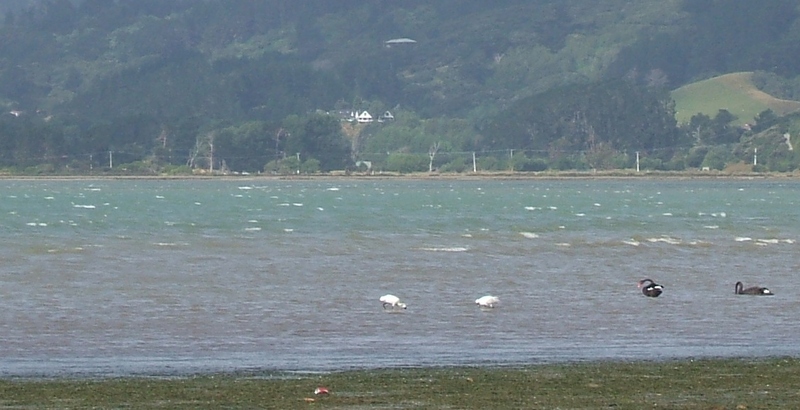 We spotted some Royal Spoonbills in the Pauatahanui Inlet along with a large flock of Black Swans. 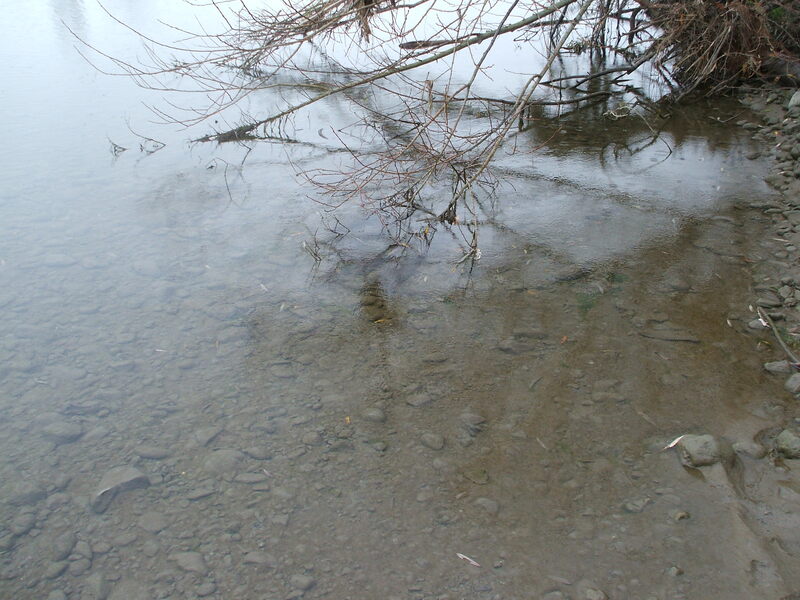 Can you spot the two vague white dots out in the water? They are the Spoonbills. We did get much closer to one but it sensed our presence and off it flew. 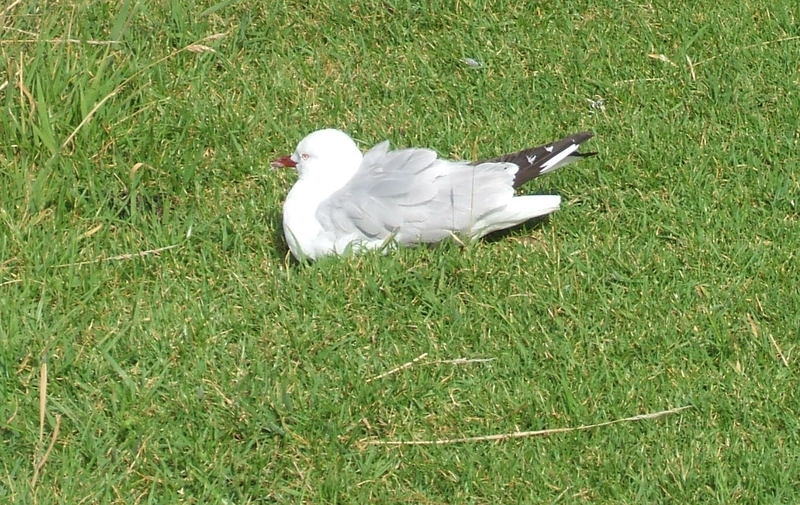 and this gull was snuggled down in the tufty beach grass taking a well-earned rest from the battering forces. A news item I read late this afternoon indicated exceptionally high temperatures in parts of Australia while the east coast of America is experiencing bitterly cold, snowy conditions. We are battened down safe and sound. Keep safe wherever you are. 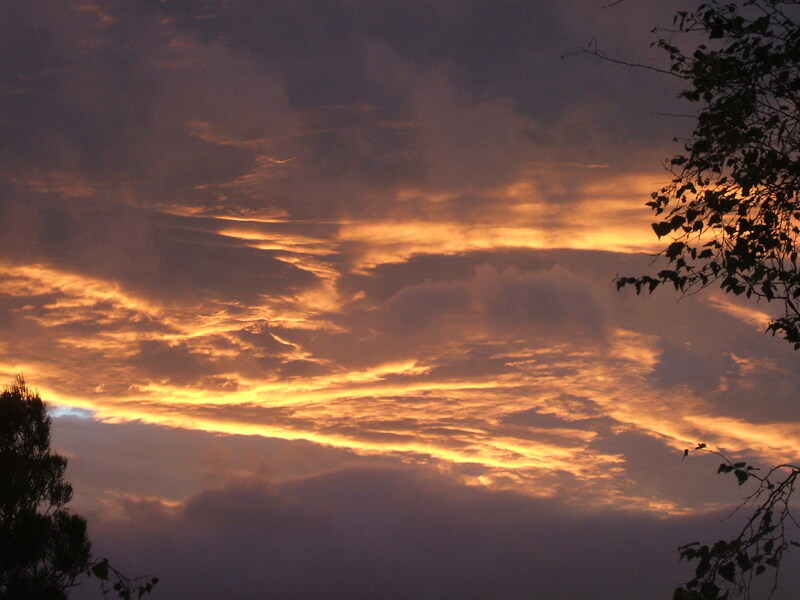 This entry was posted in Uncategorized and tagged "Red sky at night, Christmas, flooding, New Zealand, Pauatahanui Inlet, Pohutukawa, rain, Royal Spoonbills, shepherd's delight", storms, sunsets, weather on January 3, 2014 by ordinarygood. 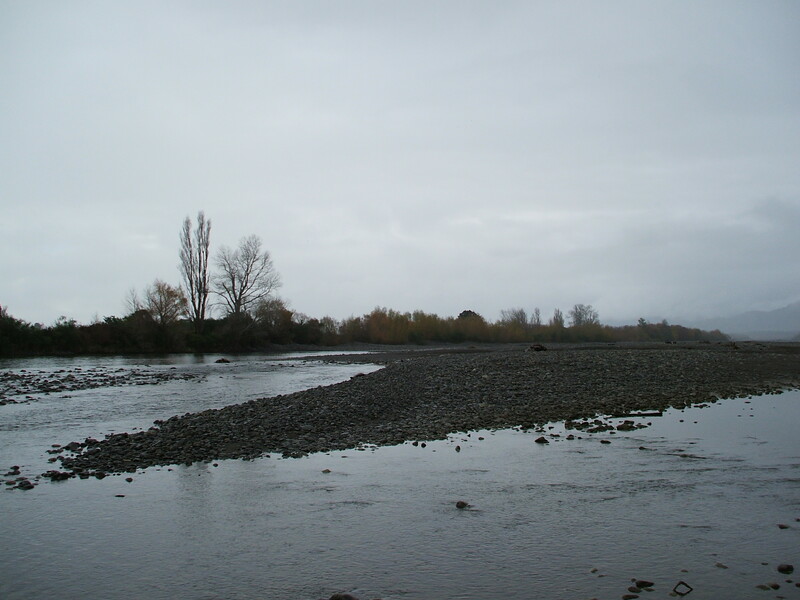 The entire North Island of New Zealand has been declared a drought area. It is very, very dry and rain is desperately needed. We have been told that there is only 20 days of water left before emergency supplies will have to be used. We are being told to conserve water in any way we can now. 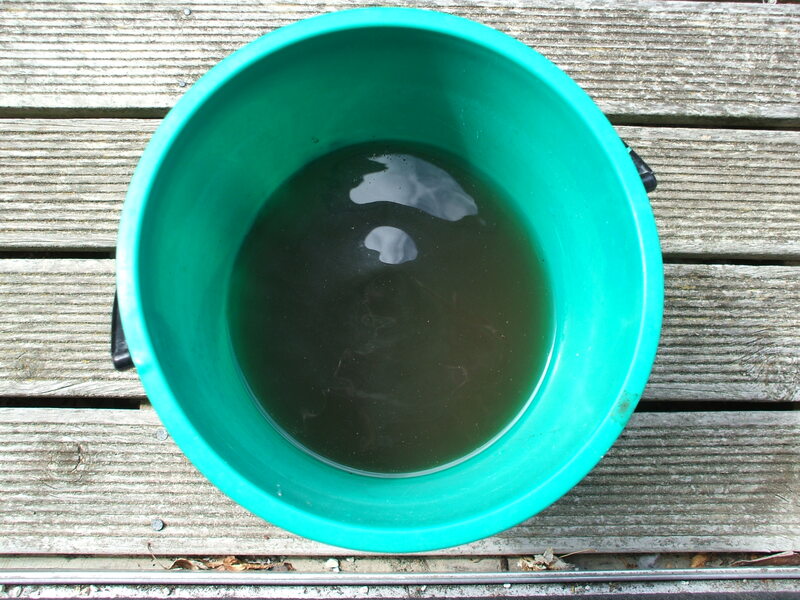 Any water for the garden must be “grey water” collected in a bucket. No more sprinklers or hose use until we get significant rain. Here is my bucket with grey water from the kitchen sink. I also take my trusty bucket into the shower with me for the brief wash that has become. I am slowly going around the garden tipping the grey water very carefully on to the thirsty plants. Today’s paper has further hints on water conservation. We are also invoking a ditty that my young niece used to tell us when Auckland was in the grip of a water shortage a number of years ago. It takes a good deal of mind shifting to capture “grey water”, to be aware of just how much trickles or runs down the pipes and how easy it is to waste water. Fresh water is such a precious resource that is so easy for us to take for granted here in New Zealand where we usually have plenty. Amidst all the new water saving routines that are being required came a letter from our City council telling me that for at least four days next week there could be very low water pressure or perhaps no pressure at all in the house. The good news is that it is all part of upgrades to water reticulation services to help prevent problems in the future. If drought periods are to become more frequent here it is very reassuring to know that planning is underway to cope with that eventuality. So I need to store some water next week to ensure any needs between 10am and 4pm are covered. Water is certainly on my brain at the moment. This entry was posted in Uncategorized and tagged buckets, conservation, drought, fresh water, garden, grey water, New Zealand drought, plants, rain, water, water conservation, water reticulation on March 16, 2013 by ordinarygood. The sun has been a rare visitor here for the past two or three weeks. We have also had a lot of rain. Some has fallen in dramatically heavy showers while other rain has sifted down as drizzle. The ground is waterlogged so gardening is not easy to do right now. So any sun that appears right now is very, very welcome. Nature has provided me with some different sunshine to bring inside and enjoy. Sending you sunshine wherever you are. This entry was posted in Uncategorized and tagged daffodils, freesias, gardens, nature, photography, plants, rain, spring, sunshine, weather on August 18, 2012 by ordinarygood.